When it comes to creating content, there are often two types of bloggers. On one end of the spectrum is the total perfectionist. They’re so worried about their post being completely perfect that they never actually write or publish anything. On the other end of the spectrum is the “just get it done” person. They just slap whatever they feel like on a page, hit publish, and move on. And unfortunately for both types, neither are the most effective ways to blog. An after-writing-your-blog-post checklist. You can download our speedy checklist HERE to keep next to your computer for review after each and every post you publish. Because the truth is that writing a blog post is just the first step in the process. The reality is that if, as bloggers, we don’t do everything we can to maximize the effectiveness of that blog post, we’re going to miss out. And that’s why having a post-writing checklist can be incredibly helpful for getting the maximum leverage out of each and every blog post. If you’re a perfectionist, having a checklist helps you visualize all the things you need to do before you publish, and puts your mind at ease that your post is ready to go out into the world. For the “get it done” folks, a checklist helps you slow down and go through your post to make sure you haven’t missed anything before you hit the “publish” button. The good news about establishing the right systems in our writing and publishing cycles, and going through our checklist every time we write a blog post, is that after a while, it becomes second nature. We won’t even need the checklist anymore because we’ll automatically do everything we need to do to get the most out of our blog posts — which will seriously pay off in the long run. The first thing we want to do after we finish writing a blog post is stop, take a breath, and wait to hit the “publish” button. When we write a blog post we’re really enthusiastic about, it’s easy to get carried away and want to hit “publish” immediately. We wrote something amazing! We have to get it out into the world ASAP! But… that’s not always the best strategy. It’s important to take a step back and sit on the post for at least a day. Taking a little bit of space gives us the opportunity to look at the post with a fresh set of eyes and give it a final polish before publishing. And 99% of the time, we’ll find typos, mistakes, or something we want to change during the final editing process — things we would have missed if we had been too quick to hit “publish”. Take a little space to look at the post with a fresh set of eyes and give it a final polish before publishing. Next up is to jazz up our post with some visuals or graphics. Visuals are key to driving traffic from social media, so depending on how long our post is, we need at least one Pinterest-worthy graphic (like a long-format photo) that will grab people’s attention and pique their interest. If the post is on the longer side, we’ll also want to add a few images or graphics throughout the post to break up the text; stock images work great or, if we’re being more budget-conscious, we can use our own photos! The point is, we want to use visuals to help tell the story (and make our posts more visually interesting for our readers). The next step is to optimize our blog post for SEO. That includes adding in our meta tags, our meta title, and our meta description, as well as making sure that our post is optimized for our target keywords. We use the Yoast SEO plugin to handle the keyword side of things, and it’s super helpful. The Yoast plugin tells us what we need to improve in the post to optimize for SEO and will give us a “green light” (in the form of a green button) when the post is ready to go. Now, I’ll be honest — not every post I publish gets the green light in Yoast. But we should always aim for it and make sure we have the post as optimized as possible before we hit publish. Yoast also allows us to optimize the post for social media, so while we’re in there, we need to make sure we add the same title tag we used for the post to the Facebook title, add a Facebook meta description, and upload a Facebook-sized image to be shared once we publish our post (this is really important because if we don’t pick our own image, Facebook will just choose a random image from our page… and it might not have anything to do with what our post is about). Once we’re sure everything is optimized for SEO and social media, we can move on to the next step. We use the Social Warfare plugin for our social media sharing, and we love it! Fill in what promotional copy you want to use for each platform, upload the photo, and then schedule it to go out on each platform once we publish the post. It’s super easy and keeps everything organized in one place. Next on the list is creating the social media copy we’ll need to promote our post once it’s live. Each platform is different, so we might want to use different copy to promote the same post; for example, we might have a longer piece of copy to promote on Facebook and then use a shorter snippet to stay within Twitter’s 280-character limit. When it comes to writing effective social media copy, it’s important to think about using our voice to really grab people’s attention. I like to keep my copy super conversational and start off with a question, like “Do you wish you had more time in your day?” Starting with a question really gets people into the copy — and will get them clicking into the post. It’s important to set a featured image that looks amazing and really grabs the reader’s visual interest.Once our copy is ready to roll, it’s time to set a featured image for our post. Our featured image is what shows up as a thumbnail for our blog post (and, depending on your theme, it could also potentially show up on your category pages), so it’s important to set a featured image that looks amazing and really grabs the reader’s visual interest. Once you’ve checked everything off the list, it’s time to schedule your post to be published! We like to schedule our posts ahead of time, but it’s also totally okay to publish in real time. Go ahead and secure as many networks in your name as possible, especially the big social networks or any that you think you might use one day. Be sure to include social icons somewhere on every page of your site directing people to your different social networks. Social Warfare is an awesome plugin that has amazing free features. When you’re setting up the plugin, make sure that it is set to share on every blog post and will display at both the top of the page and as the reader scrolls. There are plenty of free WordPress plugins that do this for you, such as “Pinterest Pin It Button On Image Hover”. Simply install, activate the plugin, and that’s it! To do this, you can use a free WordPress plugin like “Tweet This.” Within your blog post, there will be a Twitter bird icon located within your visual post editor. Click the icon and insert the quote as you want it to appear on your blog, and as you want it to appear on Twitter. It will automatically pull the blog post link as well as your Twitter handle (just add that to the Social Warfare plugin settings when you initially set it up). Don’t forget to include a call-to-action at the end of your posts reminding your readers to share on social media if they found your post helpful. As soon as the post is live, we need to share on whatever social networks we’re active on. Because the more we share on social media, the more eyes we will get on our post and the more successful it will be. Once our post is live, it’s time to share, share, share! Promoting our blog posts is KEY to success. Pin to Pinterest, share on Facebook, tweet a link to the blog post, post on LinkedIn… As soon as the post is live, we need to share on whatever social networks we’re active on. Because the more we share on social media, the more eyes we will get on our post and the more successful it will be. Ensuring that your posts are shareable for other people is also essential. The truth is, most content goes viral from other people sharing it! How do you get other people to share for you? Make it easy for them, and then ask! 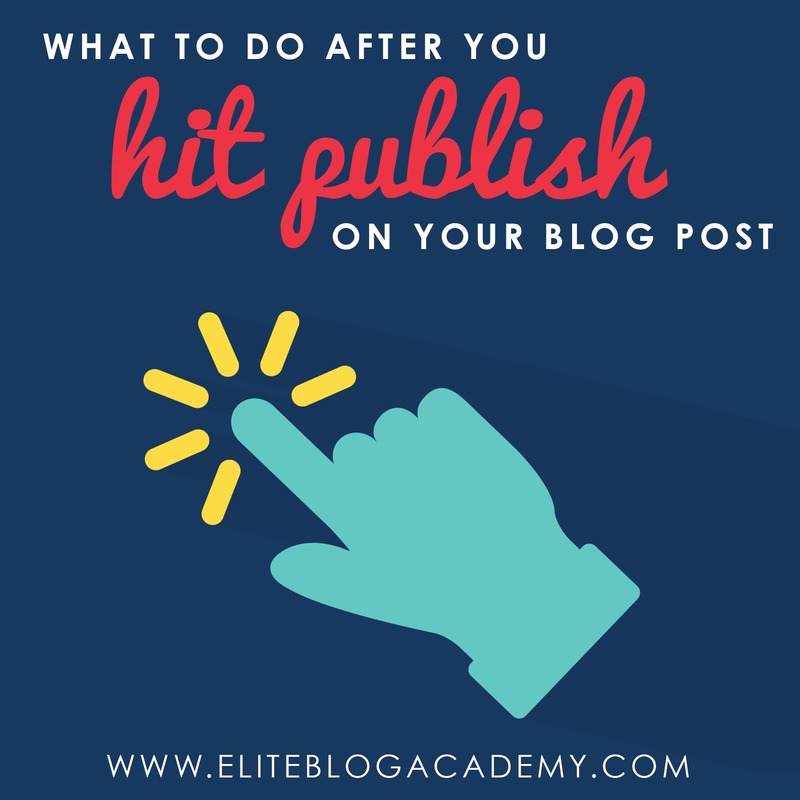 This checklist will make sure we do everything we can to get the most out of our posts before and after we hit the “publish” button. So start checking away! I’ve read the whole post. The checklist is almost similar to mine. In this post, I’d like to add some points to check before hitting the publish button which I do every time. * Reduce image file size. If I use CANVA (I normally use photoshop) to design my post image, I use TinyPNG to reduce image file size. * Select post category and tags. * Finally, I preview the post before scheduling. However, thank you for sharing your checklist. So helpful! Thank you, Ruth! And thank you for your added “checklist” item,” Liton! Thank you, I appreciated this. I realized my need to dig deeper into my post promotion.